Long-time residents, business owners, former residents and new additions to Bellevue are all welcome to this meet and greet in bayne park! 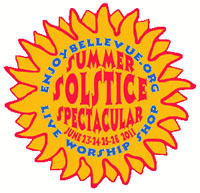 bellevue is the place to be enjoying this wonderful life as we! Find your street and meet and greet, your then and now neighbors, street by street! Yoga in the park will teach the basic yoga essentials while being in the calming outdoors. learn breath and body awareness through a series of postures followed by relaxation, a great way to end the work week and begin the weekend. Teaches us how to calm the body and BREATHE!